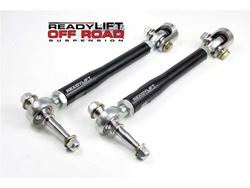 If you are running large, heavy wheels and tires or if you do a lot of off-roading, then you'll want to look at ReadyLIFT tie rod steering kits! These heavy duty steering kits are have been used for years in off road races like the Baja 1000 and are virtually indestructible! ReadyLIFT tie rod steering kits are able to handle larger amounts of compression and tension loads than your average factory steering kit. Larger lined heim joints allow for maximum articulation and strength. These tie rods are hard anodized black aluminum. Each tie rod kit also comes with a stainless steel machined clevis and a heat treated adapter pin. These steering kits can be used if your truck is leveled, lifted, or just at stock height. Increased tension loads and large amounts of compression are common in off road vehicles and trucks running big heavy wheels and tires. Don't worry about breaking down in the middle of nowhere, get a ReadyLIFT tie rod steering kit now. The made in America quality is sure to put you at ease. If not, they do come backed by a limited lifetime warranty against any defects in materials or workmanship.